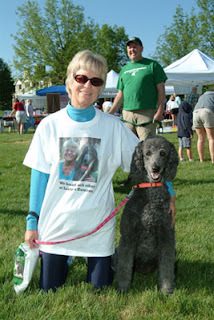 Fido and Friend in Five: Cynthia Lord and Milo! 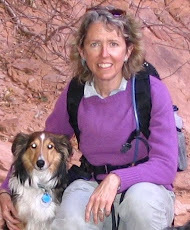 In 2006, a new name and extraordinary talent burst on the children's book scene when Cynthia Lord published her first book, Rules. This beautiful, heart-wrenching and heart-warming story of a young girl and her autistic brother went on to win the coveted Newbery Honor award, the Schneider Family Book Award and just about every state's children's book award there is. I must say, it's got to be hard to start out with a debut book that garners that much acclaim. Where's an author to go from there with their next book? 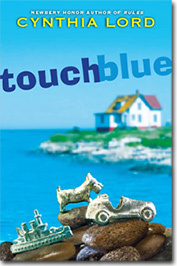 Obviously, Cynthia was undaunted because in 2010 she gave us another splendid story in Touch Blue, which of course, went on to win a bucket full of awards. She's also the author of the hilarious picture books, Hot Rod Hamster and Happy Birthday, Hamster. 1. How did you and Milo find each other? 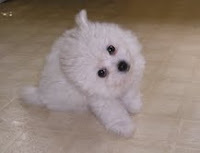 Our dog before Milo was named Flurry. He was a lovely, gentle Bichon Frise, but he became diabetic and eventually was so sick that we had to have him put to sleep. 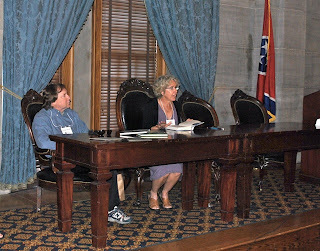 So we had our hearts broken in June of 2007, just a week or two before I had to get on a plane and go to ALA to accept a Newbery Honor and Schneider Family Book Award for Rules. When I came back home, our house felt hollow without Flurry. A dog is so "present" in our households--our days are marked by feeding them, letting them in and out, making room for them beside us, etc. I was reminded of Flurry a hundred times a day that summer, and it was like losing him again, in little pieces. In August, I said something to my husband about that loss, and he said, "Well, maybe we're just dog people." In Maine there's a little magazine and online site where people offer things for sale. It's called "Uncle Henry's", and I looked on line at photos of puppies. 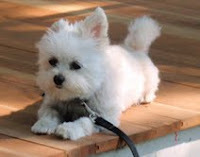 Milo was in a litter of Maltese-Pomeranian mix puppies at a breeder three hours away from us. I fell in love with his little face. My husband was hoping for a more "manly" dog this time, but I showed him Milo's photo and said I wanted to just go "look." My husband rolled his eyes and told me to be sure to bring everything I needed to drive home with a puppy (smart man). 2. What makes Milo's tail wag? Milo loves his people. I do a lot of school visits, and I have a daughter in college. When Milo sees us come home after being away, he stands completely still, like he can't quite believe his eyes. Then we say his name and he turns into 7 pounds of of wiggly-waggly joy! He just explodes into action--he'll hop into our lap and then hop off and grab a toy and then lick us and...it's like he's trying to cram everything we've missed together in five minutes. He also likes cheese, cuddling up next to us, and his stuffed toys (sheep being his favorite!). If I want him to drop something he isn't supposed to have, I pick up one of his toys and pretend I'm playing with it. He can't stand it! He'll drop everything to get it back. 3. What's your all-time favorite dog story? When I was in third grade, my teacher read to us aloud Hurry Home, Candy by Meindert De Jong and illustrated by Maurice Sendak. It was about a dog who is separated from his owners and tries to find his way back. It was a powerful story for me because, at one point, my teacher stopped reading mid-sentence. I can still see my desktop and the paper I was doodling on. I looked up to see why she had stopped, and she was crying. It was a powerful moment for me. I couldn't believe a book could do that. I think it was one of the defining moments that helped me become a writer. I also love the Henry and Mudge stories by Cynthia Rylant, illustrated by Sucie Stevenson. There's such warmth and love between those characters--it's how I feel about all the dogs I've had in my life, too. 4. If Milo could change just one thing about you, what would it be? Milo is one of the more dominant dogs I've ever owned--which is a funny contrast, given his size. But Milo would like to be the one in charge! So if he could change one thing about me, I suspect it would be for me to be his pet and give him everything he wants! 5. In five words, tell us what Milo means to you: My tiniest, goofiest, kindred spirit. Thank you so much to Cynthia and Milo for taking time out to visit this little blog--it was worth every bit of the wait! 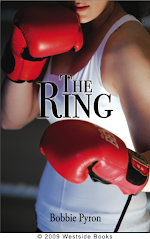 Be sure to check out Cynthia's website for her latest book news and to follow her blog, too! Blog Tour Continues: New York, Oregon, Canada, and Texas! In New York state, I visited with Reader Girls. 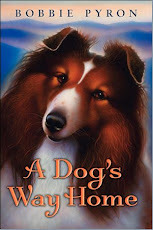 Check out this link for a review of A Dog's Way Home, a guest post by me on writing across the spectrum, and a give away! 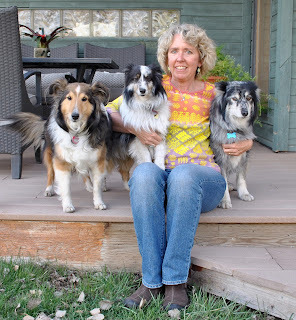 From Oregon, I went up to Canada to visit with my friend and fellow WestSide author, Cheryl Rainfield, where we chatted about why I wrote A Dog's Way Home. BTW, Cheryl has one of the cutest dogs ever! 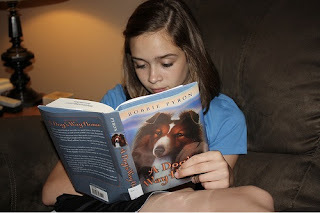 And then it was back to The Great State of Texas and a review of A Dog's Way Home on Book Twirps ! Whew! I'm worn out, and we're not even done! I also wanted to post a link to another blog (not part of the tour) I had the great good fortune to be a part of. It's a wonderful little blog called From Alone To Home that posts inspiring, heart warming, funny stories about people and their adopted pets. Here you'll get to read all about my pack. You'll have to scroll down a ways to see our posting, but you'll get to read some great stories and see wonderful photos along the way. 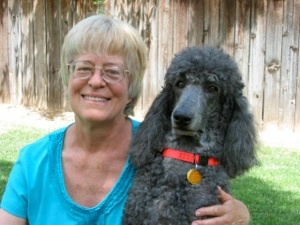 Fido and Friend in Five: Marianne Mitchell and Misty! As most of you know, my day job is as a librarian for the Salt Lake County Library System. Like many public libraries, we have therapy dogs come to our library most every Saturday for the kids to read to. All of us who work in the library are so excited when the dogs come! 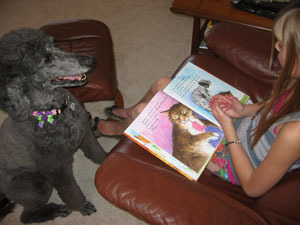 And the kids are so earnest in their reading to the dogs--and of course, the dogs are non-judgemental. So I'm particularly pleased to have in the spotlight this week author Marianne Mitchell and her therapy dog/Read Dog, Misty. Marianne and Misty are quite a team, volunteering in many different capacities to help homeless pets, and share their love of books with kids. 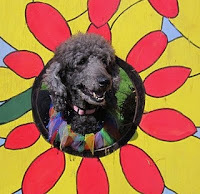 As if she isn't busy enough, Misty--yes, Misty the dog--has her own blog! She not only talks on her blog about their volunteer exploits, but also shares dog treat recipes and talks about her favorite books. Sign up because, I mean seriously, how many dog's blogs do you follow? Marianne is a busy, busy author. 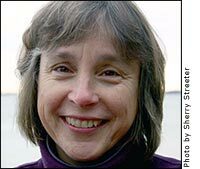 She's the author of numerous books, ranging from mysteries for middle-graders to folk tales for the young-uns. 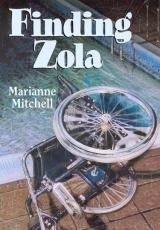 Her novel, Finding Zola, is a riveting mystery about a 13-year-old wheelchair-bound girl determined to solve the mystery of her neighbor's disappearance. Her lovely picture book, Maya Moon, is a re-telling of the folk tale from Mexico that explains why the moon changes shape. 1. How did you and Misty find each other? I was a volunteer at the Larimer Humane Society in Fort Collins, Colorado, when Misty (then called "Mystique") showed up on their website. My first words to her were, "Hello, gorgeous!" She was five years old then and her previous owner had become too sick to keep her. I wish that lady could know how happy Misty and I are to have each other. After her adoption, I had a t-shirt made up with our picture on it saying, "We found each other at Larimer Humane." We celebrate her adoption date each year with a donation to Larimer Humane. 2. What makes Misty's tail wag? When we lived in Colorado, it was chasing squirrels along the fence. Now in Arizona, it's chasing lizards as they scurry from bush to bush. She never catches them, but she loves the hunt and wags her tail the whole time. She also wags and jumps when it's time for us to go listen to kids read to her at the library or at a school. 3. What's your all-time favorite dog story? 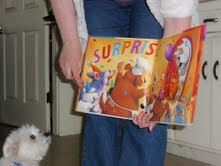 My favorite picture book featuring a dog is My Big Dog, by Janet Stevens and Susan Stevens Crummel. I once had a golden retriever like the dog in that story. 4. If Misty could change just one thing about you, what would it be? She'd like me to be smart enough to teach her something really hard, like astrophysics. She loves the challenge of learning new things and the biscuit rewards that follow. 5. In five words, tell us what Misty means to you: Love. Comfort. Friend. Motivation. Inspiration. You are so right, Marianne. Thanks so much to this inspiring, motivating duo for visiting Fido and Friend! Check out both Marianne and Misty online to find out their latest adventures! I'm just back from the Southern Festival of Books in Nashville, Tennessee! Besides seeing my sweet cousin and eating lots of good Southern food (fried green tomatoes, collard greens, fresh shrimp from the Gulf coast, lots and lots of barbeque), I spent Saturday at the book festival. There were tons of amazing authors there--it was a librarian's dream! I heard Alexandra Styron read from her touching memoir about her famous, tortured father in her book Reading My Father: A Memoir. Then I raced over to another venue to hear two of my favorite Southern authors, Clyde Edgerton and Josephine Humphreys talk about their work and read. Edgerton is the master of southern dialogue. And he's so funny! 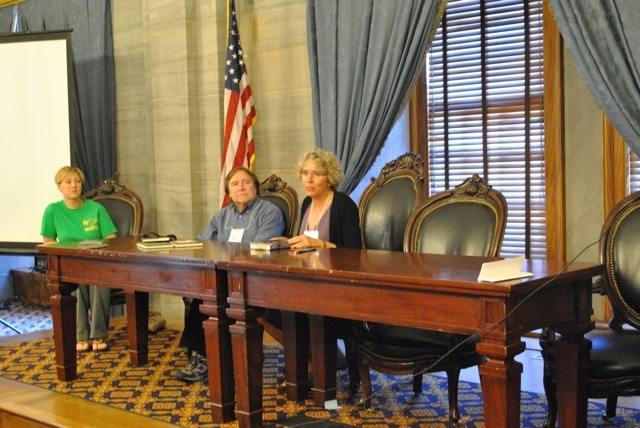 Next I dashed over to the Capitol Building to hear my good friend Ruta Sepetys give an amazing and heartbreaking presentation on the story behind her best seller Between Shades of Gray. I was so proud of her and the success of that book. It deserves it. After Ruta, Charles Frazier (author of the award-winning Cold Mountain) talked about his latest book, Nightwoods. Another one I must get my hands on. Oh, and yes, I was there as an author myself! Roger and I each read bits from our books, talked about why we like writing for kids and teens, and answered lots of questions from a small but enthusiastic audience. 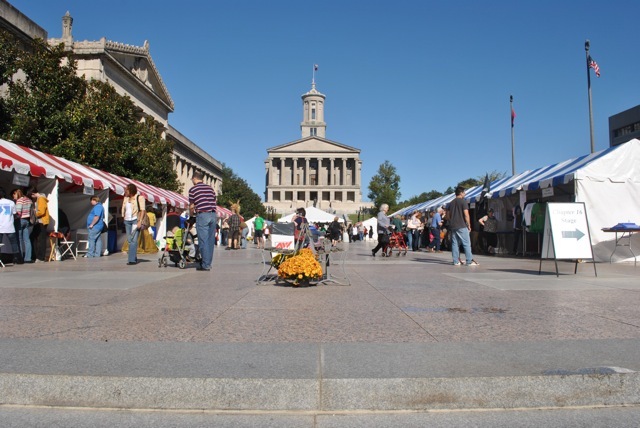 I was so thrilled to be in Nashville since part of A Dog's Way Home takes place in the city. And I'll take any excuse to go "back home" to the South. Blog Tour Stops: Mass. to Virginia to Nebraska! I've make a couple of quick stops on my blog tour! Mia, in Mass., just posted a list of the Ten Best Dog Books on her blog Pragmatic Mom. I'm honored A Dog's Way Home is included with books such as Because of Winn Dixie, Love that Dog, Shiloh, and How to Steal a Dog. I'm not quite sure how I feel about Walter the Farting Dog being on that list. Seriously? Then on to Nebraska! Although my "official" visit with Allison's Book Bag isn't for a week, she posted a lengthy teaser on her blog in anticipation of my visit. Allison asked me some of the best questions I've ever been asked in an interview, so be sure to check back in a week when the review and interview are up! Being the jet setter that I am, I also popped in to visit with Amanda in Virginia and her blog A Patchwork of Books. She's also doing a give away of my book, so check it out and leave a comment! Whew! What a busy week's this has been! Fido and Friend in Five: Ellen Booraem and Callie! Okay, confession time: I am a total Newbery Geek. I love the anticipation and announcement of the annual Newbery Awards! 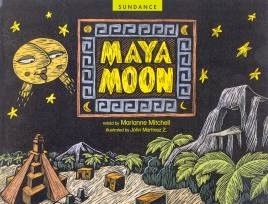 To me, it's the Oscars of children's literature. Last year, I actually got to check off my "bucket list" attending the announcement of the Newbery winners at the American Library Association's midwinter conference in San Diego. My wonderful editor of The Ring, Evelyn Fazio, is also a Newbery Geek, so we attended the award announcements together. It was so much fun! 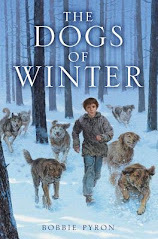 About this time of year, I start trolling the internet to see what books are getting "Newbery Buzz." 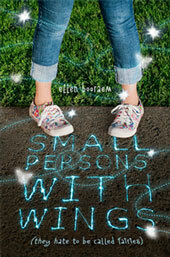 One title that kept coming up was Small Persons With Wings, by Ellen Booraem. Intrigued, I read the book. Although I'm not a big fantasy reader, I loved this book! In Booraem's funny, beautifully written story, thirteen-year-old Mellie Turpin discovers she and her rather ordinary family are actually bound (through many generations) to tribes of fairies--or as they'd rather be called "small persons with wings." This association proves not only proves very troublesome but deadly too. Ellen is no stranger to fantasy. 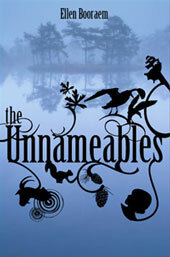 She also wrote the popular novel The Unnameables, introducing the unforgettable Goatman--a nameless, smelly wanderer who calls the wind but can't control it and who can't keep a secret to save his life. 2. What makes Callie's tail wag? We have a 7:00 am neighborhood dog walk involving one or two or sometimes three other dogs. Callie adores it--she loves hobnobbing with the other dogs. But also, the road sees a lot if carpenter and fisherman traffic, which means lots of discarded pizza crusts. When I reach for my shoes at 6:50, her tail goes helicopter! 3. What's your all-time favorite dog story? This is obscure, but there's a Georgette Heyer novel called Arabella in which the heroine causes the elegant Regency hero to adopt a scruffy street mongrel. The evolving relationship between man and dog is the most adorable thing I ever read. 4. If Cassie could change just one thing about you, what would it be? She would want to agree that eating copious amounts of grass were good for her. I would have to ignore the fact that, at best, she ferments the grass in her stomach for three weeks before upchucking it at the foot of our bed at three in the morning. At worst, she get a blockage and has to go to the vet for relief. She particularly loves tall, thick grass after rain. We often have words about this. 5. In five words, tell us what Cassie means to you: Comic relief, partner in crime. We all need both! Thanks so much to Ellen and Cassie for dropping by Fido and Friend. 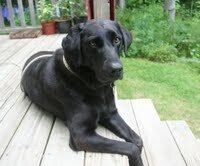 And a very heartfelt thanks to Ellen for giving Callie such a wonderful life after such a terrible start (sniff, sniff). Be sure to check out Ellen and her books on her website and follow her blog. It's a lot of fun! During the month of October, I'll be going on tour--blog tour, that is! I'll be stopping in to visit with ten different bloggers who'll be reviewing my books. Some will also interview me, offer a signed copy of my book(s) and have me do a guest post. It's going to be a lot of fun! The first stop on my tour is with Bev's blog, The Wormhole. Bev lives in Minnesota. 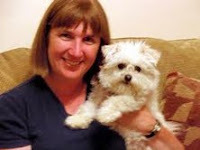 She's posted a wonderful review of A Dog's Way Home, plus a guest post of mine. She's also doing a giveaway of a signed copy of my book! Pop on over and visit!